Thank You for Shopping! Click Here to View Our Company Policies! SPECIAL PRICE - INCLUDES SHIPPING. 6 - 1/2 Pints 100% Pure Sorghum Syrup. Flat Rate Shipping is included in the price. SPECIAL PRICE - SHIPPING IS INCLUDED. 100% Pure Sorghum Syrup. Flat Rate Shipping has been added to the price. SPECIAL PRICE - SHIPPING IS INCLUDED. 3 Pints 100% Pure Sorghum Syrup. Flat Rate Shipping is included in the price. SPECIAL PRICE - SHIPPING IS INCLUDED. One Quart 100% Pure Sorghum Syrup. Flat Rate Shipping has been added to the price. SPECIAL PRICE - SHIPPING IS INCLUDED. 1 Pint & 1 Quart of 100% Pure Sorghum Syrup. Flat Rate Shipping is included in the price. SPECIAL PRICE - SHIPPING IS INCLUDED. 3 Quarts 100% Pure Sorghum Syrup. Flat Rate Shipping is included in the price. The shipping is for continental U.S. and excludes Hawaii & Alaska. SPECIAL PRICE - SHIPPING IS INCLUDED. One Pint each of Pure Sorghum Syrup, Pure Honey, and BBQ Sauce. Flat Rate Shipping is included in the price. SPECIAL PRICE - SHIPPING IS INCLUDED. 1 - 1/2 Gallon 100% Pure Sorghum Syrup. Flat Rate Shipping has been added to the price. SPECIAL PRICE - SHIPPING IS INCLUDED. 2 - 1/2 Gallons 100% Pure Sorghum Syrup. Flat Rate Shipping is included in the price. The shipping is for the Continental U.S. and excludes Hawaii and Alaska. Sorghum Syrup, 100% Pure, with no additives. Sorghum Syrup. 100% Pure with no additives. Sorghum Syrup, 100% pure with no additives. Sorghum based BBQ Sauce made by Sherry & Mark Guenther; just slightly spicy with chipotle. Pure Honey made from hives on our farm at Muddy Pond. Gift Box containing 1 pint each of Sorghum Syrup, Barbecue Sauce, and Honey. Shipped in a beautiful gift box with crinkle paper. 144 Pages of Sorghum Syrup Recipes including breads, candy, cakes, cookies, pies, vegetables, meats, salads etc. 140 Pages of Sorghum Syrup Recipes including breads, cakes, cookies, pies, meats, salads, vegetables, slow cooker etc. 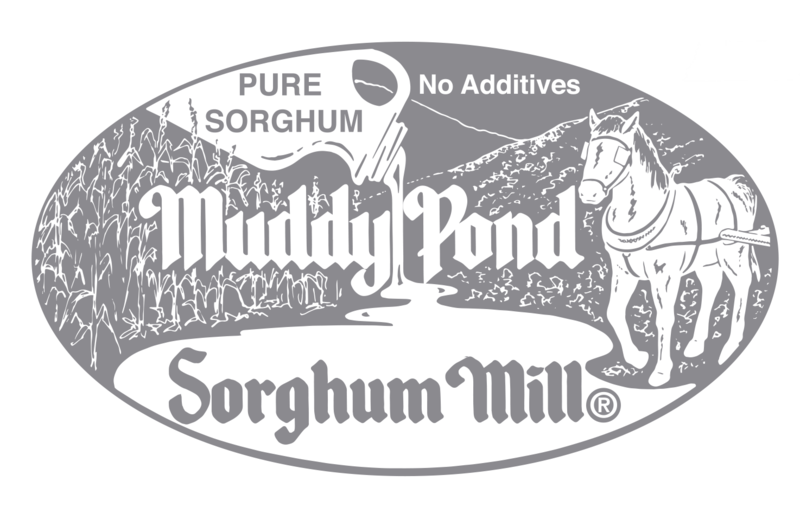 Muddy Pond Sorghum, LLC acknowledges requests for refunds within 7 days of customers receiving their order and only for damaged products. If you ordered the wrong item(s), please call (931) 445-3509 or email Muddy Pond Sorghum, LLC as soon as possible to cancel or change the order. Orders are normally filled within 2 business days of receiving an order. Orders are shipped through UPS or USPS. You can view shipping costs at checkout before submitting your order. Muddy Pond Sorghum, LLC is committed to protecting your privacy. We will not sell or disclose any information that identifies you to a third party without your prior approval. We may use the information we collect to periodically notify you about new services or special offers we think you'll find valuable. If you would rather not receive this information, you may send us an e-mail with "Unsubscribe Me" as the subject line. Muddy Pond Sorghum, LLC does not sell, trade or rent your personal information to others. Muddy Pond Sorghum, LLC is located in the United States of America.